An attractive, colourful centerpiece which goes with all the trimmings. * Preheat the oven to 180°C/Gas 4. Grease a 20cm loose-based flan tin with a little olive oil. Prick the skins of the sweet potatoes, put them on a baking tray and bake for 45-50 minutes until tender. Set aside to cool. * Crumble the rice cakes and put them into a food processor with the nuts. Process to a powder. If you don’t have a food processor, crush the rice cakes and chop the nuts as finely as you can. * Transfer to a mixing bowl and stir in the rice flour, baking powder, olive oil and soya milk. Season with salt and pepper and mix thoroughly. Turn the mixture into the flan tin and use your fingers to press it into an even layer covering the bottom of the tin. Bake for 20 minutes, then set aside to cool. * Peel the onions and slice them thinly. Cover a large baking tray with non-stick baking paper. Arrange the onion slices in a layer on the tray. Mix the olive oil, vinegar, thyme and lemon zest together in a small bowl, then spoon the mixture over the onions. Bake for 20 minutes, then set aside to cool. * When the sweet potatoes are cool enough to handle, peel off the skins. Mash the sweet potatoes with the lemon zest, sage, salt and pepper. Chop around half the baked onion slices and stir into the sweet potato mash, then spoon the mash onto the tart crust and smooth it out with a spatula. * Carefully arrange the remaining sliced onions over the top of the tart (a palette knife is useful for this). 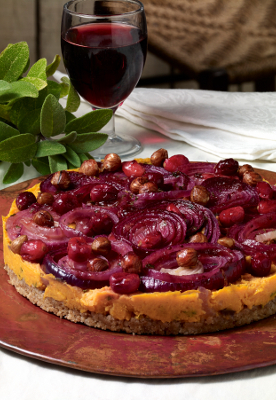 Scatter the hazelnuts and cranberries over the top and drizzle with a little olive oil. Bake for 10-15 minutes until the tart is heated through and the cranberries have started to burst. * Put the cranberry sauce into a small saucepan with 3 tbsp water and heat gently, stirring continuously until the sauce is dissolved. Pass through a sieve if you prefer a smooth glaze. Spoon the warm cranberry glaze over the tart just before serving. Garnish with a sprinkle of fresh, finely chopped sage. Recipe courtesy of The Vegan Society.